This baseball is covered with illustrations of sights from Boston: sail boats, lobster, American flag, historic Boston, and more! Very detailed and colorful baseball depicting Boston. 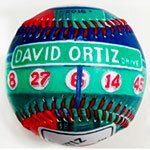 Unforgettaballs baseballs are created from original paintings that are reproduced onto authentic baseballs. 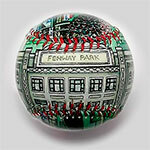 Emily M. Wolfson is the artist of the Unforgettaballs limited edition collectable baseballs. Twenty years ago when all baseballs were only white, Emily painted an American flag on a baseball from a toy store for her husband and Unforgettaballs was born. Over the years she created hundreds of designs of old and new ballparks, city landscapes, and family occasions for all types of baseball collectors. Includes a protective, clear lucite 3 1/4" x 3 1/2" x 3 1/4" display box.